The heritage of Royal Brierley spans 300 years and 15 generations. Principally, the company has grown under the guidance of three families – the De Henzels, Honeybornes and latterly, the Silvers. 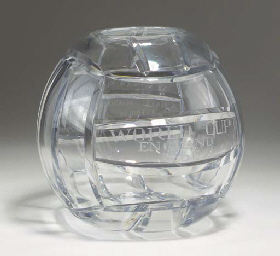 Pictured right: A Royal Brierley Crystal Bowl modelled as a football, inscribed World Cup England, 1966, also inscribed with names of the World Cup-winning side, the base inscribed No.10, 7½in. (19cm) high; and a framed newspaper cutting which make reference to the bowl (2). Sold at Christies, London, Sep 2004 for £1,195. The bowl was produced by Royal Brierley to commemorate the World Cup victory. Only twelve examples were produced. Image Copyright Christies. It was during Joseph Silver’s period of control, that the company leased the Moor Lane Glasshouse at Briar Lea Hill. His daughters married William Stevens and Samuel Cox-Williams who took control of the business in 1847. The company became known as the Stevens and Williams Glassworks. In 1870, a new glasshouse was built on land adjoining the site, making the old glassworks obsolete. 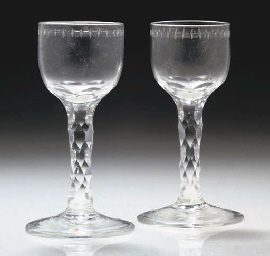 Pictured left: A Pair Of Facet-Stemmed Wine-Glasses Late 18th Century – The cup-shaped bowls engraved with borders of ovals and stars, on faceted stems and conical feet 5¼ in. (13.5 cm.) high (2). Sold at Christies, London, May 2007 for £360. (Provenance The Royal Brierley Collection, sale Sotheby’s, 3rd March 1998, lot 84.). Image Copyright Christies. Over the years, techniques and designs were introduced by craftsmen at the company, including moss agate, threaded glass, applique art glass and cameo. Skilled craftsmen including John Northwood, Harry Northwood, Joseph Keller and Frank Schreibner were responsible for a succession of major advances in crystal making, exporting ideas around the world. Stevens and Williams was used as the product name until the 1930s and an S&W astride a fleur de lys was the trademark etched on all crystal pieces. Eventually Stevens and Williams adopted the word Brierley, its own location at Brierley Hill, along with ‘Royal’ to signify its appointment as the Royal British Glassmakers and the company became known as Royal Brierley Crystal. It still holds Royal Warrants for the Queen and the Prince of Wales today. Royal Brierley is now operated by Dartington Crystal (Torrington) Ltd.